One of the biggest frustrations with a fishing package is the lack of flexibility with some operations. At Aitutaki Sports & Fly Fishing Lodge our aim is to provide that flexibility and give the customer what they want from a trip to an exotic fishing location. Below is an outline of some of the options on offer and we welcome enquiries from potential clients if they have other suggestions that they would like to put forward, after all we are here to make your trip the best one you have ever been on!!! The operation uses a 24-foot purpose-built fishing boat and one of the most experienced skippers in the region to target Yellow Fin Tuna (up to 50 KGS), Mahi Mahi, Wahoo, Dog Tooth Tuna and a number of other species that can be caught. Due to the very deep water being so close to the Island most of these can be targeted in very close and only a short boat ride to productive fishing grounds. 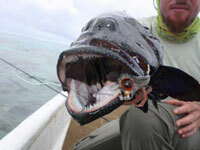 Bill fish can also be targeted for special charters and packages can be made on request. Every angler is also given a selection of fish caught during the day and has this fish cooked by the chefs at the lodges restaurant as part of the fishing packages. Aitutaki lagoon is the home to some of the biggest Bonefish in the world with trophy fish a regular catch for visiting fly fisherman (the average fish is about 7 to 8 lbs). The fishing can either be enjoyed by wading the crystal clear shallow sand flats and sight casting to big cruising fish or from a boat being polled in slightly deeper water. The lagoon also has a population of large GT's that can be targeted on fly rod for those who like their fishing to be white knuckled battles of strength and will power. Using soft plastics in and around the shallow water coral formations inside the lagoon is a very productive fishing tactic. Several species of Trevally, Cod and members of the local snapper (lutjanus) family are common captures and on light to medium tackle they provide exciting fishing for the light tackle fanatics. Using poppers on spin gear is also a very productive fishing option on the lagoon with Trevally being the main species encounter. As the lagoon is a perfect and safe setting for family expeditions it also offers some of the best family and kids fishing around. Using both soft plastics and baits a large number of species can be targeted and the action will keep the kids engaged in the fishing and enjoying the lagoon. As most of the fishing areas are situated in environments that have lots of coral it is also regular to see turtles, eagle rays, large feeding Trevally and other sea life very up close and personal. Add to this some of the most beautiful islands are very close and it is possible to leave the boat and walk to stretch the legs it offers a wonderful experience for families. The operation is also currently working to complete a mother ship that will be used for extended trips to several locations in the Cook Islands. These will be 3 to 4 day live aboard to some of the most remote fishing locations left on the planet and will with out a doubt provide fishing that will be remembered for a lifetime. This option can either be planned as part of an extended trip to Aitutaki or as a stand-alone package. Again the options are provided so the anglers can plan a package that they would like. Please contact us for more information about this planned offer.